Niobrara County High School graduate Dyann Dierks received a “Women of Distinction” honor during the recent Women’s Leadership Conference at the University of Wyoming. Dierks, a first-year graduate student in the UW communications program, was among five UW women honored for their work on campus during the two-day conference. Dierks was born and raised in Lusk and has spent the last six years in Laramie, where she received her bachelor’s degree in journalism. She is instructing her second year of public speaking courses at UW and is focusing her thesis research on the political knowledge gap and marriage rights in the United States. 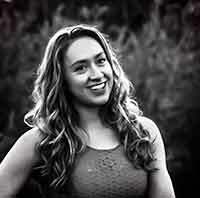 While at UW, she began her photography business and is busy photographing weddings, engagements, high school senior portraits and families throughout the state. One of her favorite assignment is photographing UW sporting events. She interned for UW Institutional Marketing her senior year at UW. The other women honored during the conference, along with Dierks, were Interim College of Law Dean Jacquelyn Bridgeman; third-year law student Sean Christina Slagle; UW police officer Ashlynne Nutter; and Rachel Watson, an associate lecturer in the UW Department of Molecular Biology.